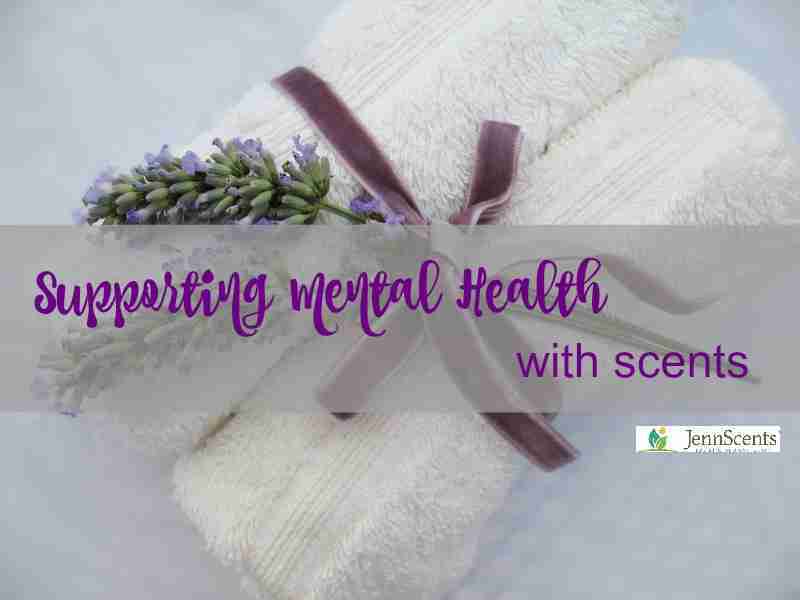 Supporting Mental Health with Scents: Aromatherapy for our Mind - JennScents, Inc. Mental health imbalances affect thousands of people in the United States, every day. Some people have trouble getting out of bed, some have debilitating fears that keep them from leaving the house or being in crowds, and others have eating disorders, sleep disturbances, depression and anxiety. Lifestyle experiences, environment, nutrition, social support and aromatherapy are key factors in daily well-being. Most people don’t realize the power a scent can have on behavior, mood, responses and reactions. Aromatherapy is a powerful tool at our fingertips that can help with any mental and cognitive issue. When you smell a particular scent or aroma, those scent molecules travel into the nose to certain processes and organs in the brain that trigger a response or reaction. It is that instant. Most scents provoke a happy memory or thought, but some can trigger an unhappy or traumatic event. This shows you the power of smell, or olfaction. Did you know that our sense of smell is the only sense we have that does not get processed via our spinal cord or gut. Simply smelling a scent actives numerous responses among our body systems to shift, alter, change, inspire, encourage, and affect your mood, behavior, responses and reactions. It can work on physical, mental, emotional and spiritual matters all at one time, simultaneously. Another cool fact is that each of our organs has an emotional counterpart, thus connecting the mind and body. For example, anger resides in the liver, grief in the lungs and fear in the kidneys. So, when you take a personal assessment of your own physical, mental and emotional issues, evaluate yourself as a whole. If you have chronic kidney and urinary issues, you might want to address your issues of fear (frankincense, Boswellia carterii, is one of my favorite oils for any fears you have). If you have chronic knee and joint pain, you may want to address what is angering you about moving forward. Knowing these connections between the physical body, mind and emotions, can help create a wellness plan of action that is customized and precise. Common mental imbalances are anxiety, depression, Post Traumatic Stress Disorder (PTSD), Obsessive-Compulsive Disorder (OCD), cognitive dysfunctions (dementia), addictions, dissociative disorders, bi-polar, panic attacks, and phobias. We have several contributors these days such as technology overload, poor nutrition, lack of movement and toxic overload from the environment. Taking time to eat at least one healthy meal a day, quiet time for yourself away from noise and technology so you can get a restful sleep, and a little movement each day can make a HUGE impact on your mental health quality. Some of my favorite tools are aromatherapy (of course), staying hydrated (50% of your body weight in ounces of water per day), in bed by 10:30pm, some form of daily stress management coupled with movement like a walk, gardening or hobby, and taking in some good nutrients like nuts, yogurt, fruits and vegetables (not fried of course, lol). Bergamot, Citrus bergamia – helpful to calm anxiety (especially when blood sugar goes awry), bouts of depression, a quick pick me up, uplifting mood, combat addictions and addictive behaviors, confusion, and a mood stabilizer (for those who fluctuate between crying and anger). Cinnamon Cinnamomum zylancium – this is a “hug in a bottle”, boosting self-esteem and confidence, inspiring courage, safety, security and comfort, and combating confusion and jet lag. Chamomile, Anthemis nobilis – known as the nurturer and caretaker, calming anger, rage, anxiety, mental chatter and hysteria, promoting a restful and nourishing sleep, combating an upset stomach (i.e., IBS) and brings peace to any situation. Jasmine, Jasminum officinale – brings love, joy and emotional strength while combating anger, irritability, cold-heartedness, insomnia and feelings of guilt. A nice scent to restore a fatigued adrenal and pineal gland, as nourish the kidneys (where the emotion of fear resides). Ylang ylang, Canaga odorata – nourishes the heart, bringing acceptance to one’s inner beauty, releasing anger and negativity to bring joy and love into the mind and heart. Helps one conquer panic attacks, OCD, bitterness, fear, guilt and PTSD. There are several ways you can put these scents to work for you. You can add a few drops of one essential oil, or combination of essential oils into an ultrasonic diffuser, necklace diffuser or car diffuser. Create a nice room, body or linen spray by adding 18-22 total drops of essential oil to 2 ounces of water or plant enzymes. Add a few drops to your shampoo, conditioner, body wash and body lotion. Combine 5-10 total drops of essential oils to a cup of Epsom Salt, mix well before adding to your running bath water. Sit back, relax and enjoy. Add 10-15 total drops of essential oil to a .33 ounce roll-on, then fill with a carrier oil. This can be your “on-the-go” scent stick. Or add a couple drops to a Nasal Atomizer. Thank you for sharing your never ending knowledge. This will be very useful.